Thought it was time for a crafty for St. Patrick's Day ( the cards are green) hee,hee. Cut your cardstock to the size of 10.5 X 5.0. One 12x12 cardstock will make 2 of these cards. If you want to stamp on it, now would be the time. Score at 1.25", 2.5", 4.25", 6" and 8.25". Fold with hills and valleys ( accordian style) making sure that the smallest fold is down. That is the front of your card. Now decorate and build up from the back. 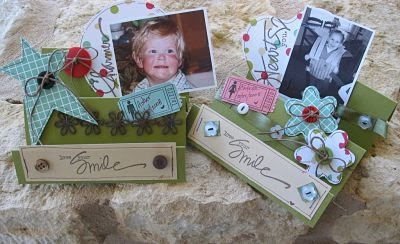 These are really fun to make and look great on the table as a birthday decoration. Have a great scrappy day!!! Thanks for stopping by. Neat cards...I haven't seen those type before. Thanks for the post! Great cards! Thanks for the "how-to"
Cute. I just might have to try these. These very well could be my Easter cards for family with pictures that we had taken with live bunnies! GREAT!